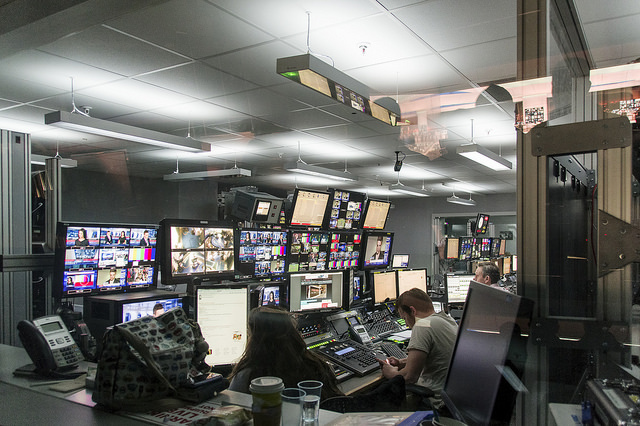 A news control room. Photo courtesy of Ross G. Strachan via Flickr Commons. For decades, the mass media has shaped the world’s view of what is important in our daily lives—our social and political realities—through its ability to influence information and how it is presented. As such, the media has been, and still is, a powerful tool in shaping our perceptions of what matters in our world today. If used well, this inherent power of the media can be of great value in the prioritization of the demographic dividend framework in Africa’s policymaking processes. The media has the power to raise the profile of the demographic dividend agenda in Africa’s development conversations and sustain policymakers’ attention. At any given time, policymakers have several competing policy priorities that may be influenced by their personal interests, opinions, and worldview, not to mention the complex nature of the policymaking process that involves many moving pieces. Media coverage of issues relating to the demographic dividend is critical now more than ever. Despite high-level conversations on the demographic dividend over the past five years, including the 2017 African Union Summit where African leaders committed to investing in the large youthful population to steer development, there is still worry that the demographic dividend ‘hype’ may die out if these conversations do not translate into action at the policymaking level. Can Evidence Fix Africa’s Governance Challenges, Or Are We Flogging a Dead Horse? 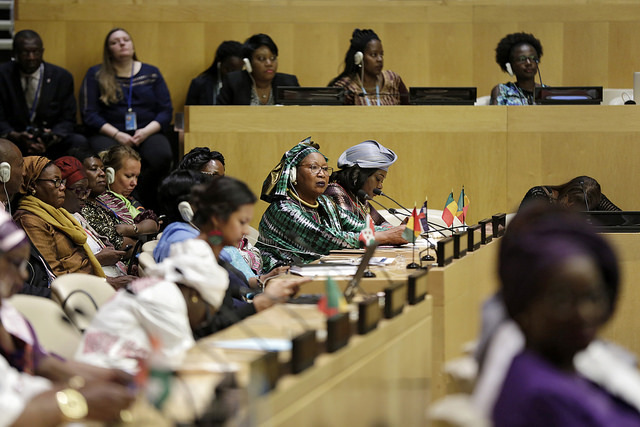 African Women Leaders Network. Photo courtesy of the United Nations via Flickr Commons. Today, African leaders agree that Africa has a great opportunity to reap economic benefits from strategic investments made to the continent’s current large youthful population. In the 2013 Sixth Joint African Union Commission (AUC) and United Nations Economic Commission for Africa (UNECA) Annual Conference of the African Ministers of Finance, Planning, and Economic Development, policymakers and experts recognized the potential of the demographic dividend to transform Africa by reducing poverty and spurring economic growth. Since then, as a result of continuous engagements between population and development experts and policymakers over the years, several other milestones have been achieved. These include the Addis Ababa Declaration on Population and Development in Africa Beyond 2014; the African Union (AU) Common African Position (CAP) on the Post 2015 Development Agenda; and the Africa Agenda 2063– The Africa We Want. These milestones culminated into the 2017 AU theme, where African leaders committed to investing in Africa’s large youthful population to drive development. We can now say that there is a continental consensus between policymakers and experts on the potential the demographic dividend has to transform Africa. Insider-Outsiders: Do Experts Know How Far their Evidence Travels in the Policymaking World? H.E. 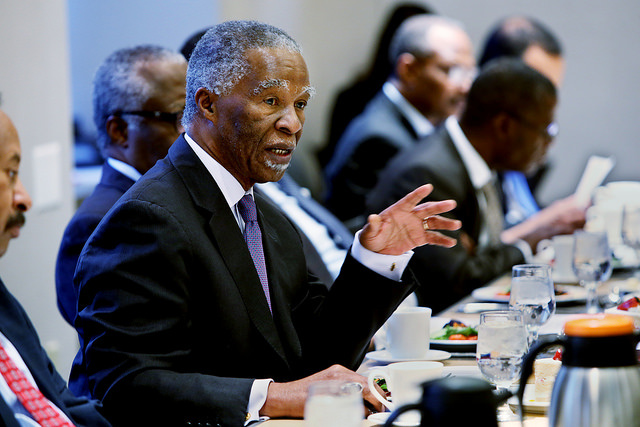 Thabo Mbeki, Former President of South Africa at a high-level policymaker discussion conducted by the Brookings Institution Africa Growth Initiative on February 17, 2016. Photo courtesy of the Brookings Institution via Flickr Commons. I recently commenced my research fellowship at the Woodrow Wilson International Center for Scholars. I have begun navigating the research and policy landscape of the United States and discussed elements of my research with a couple of experts in Washington.